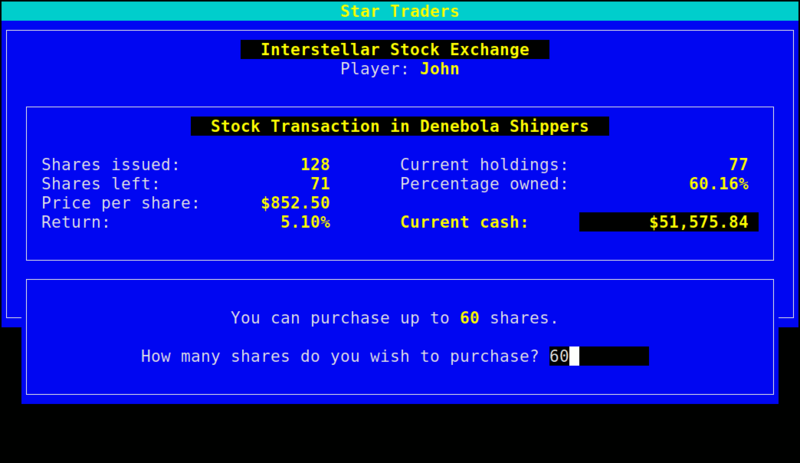 Star Traders is a simple text-based game of interstellar trading, where the objective is to create companies, buy and sell shares, borrow and repay money, in order to become the wealthiest player (the winner). 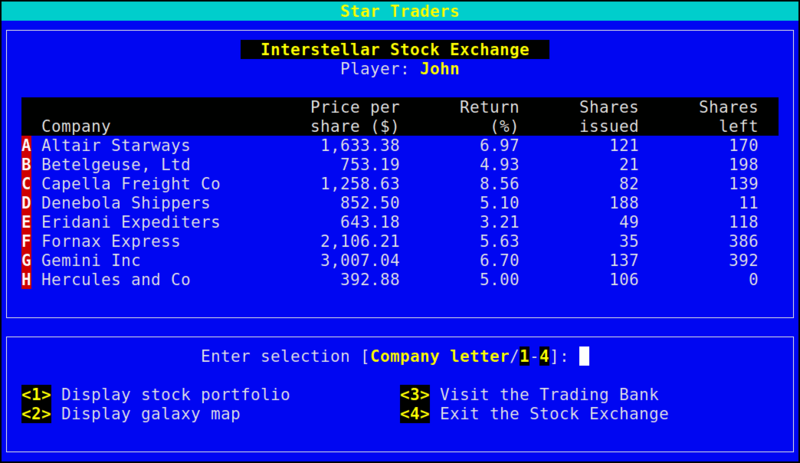 The current version of Star Traders runs under any modern Unix or Unix-like operating system that has a working C99 compiler. This includes, of course, Linux, macOS, FreeBSD and Cygwin. Currently it can run in any one of twelve human languages. Historic versions are available for MBASIC, CP/M-80, CP/M-86, MS-DOS, Windows 3.1 and the Commodore 64. 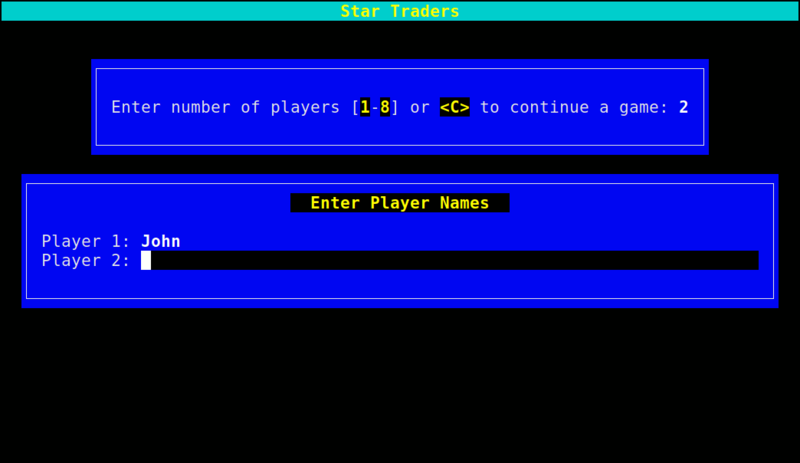 The current version of the game is Star Traders 7.12 [tar.xz version, 576KB, GnuPG signature; tar.gz version, 1.1MB, GnuPG signature]. You may download the source code, as well as difference files, from the FTP repository for this package. Full installation instructions are available, including the prerequisites needed for building the package. Precompiled binary packages are available for Debian, Ubuntu, CentOS, Fedora, OpenSUSE, Mageia and Cygwin. An APT repository for Debian and Ubuntu is also available to make your life easier under those distributions of Linux. 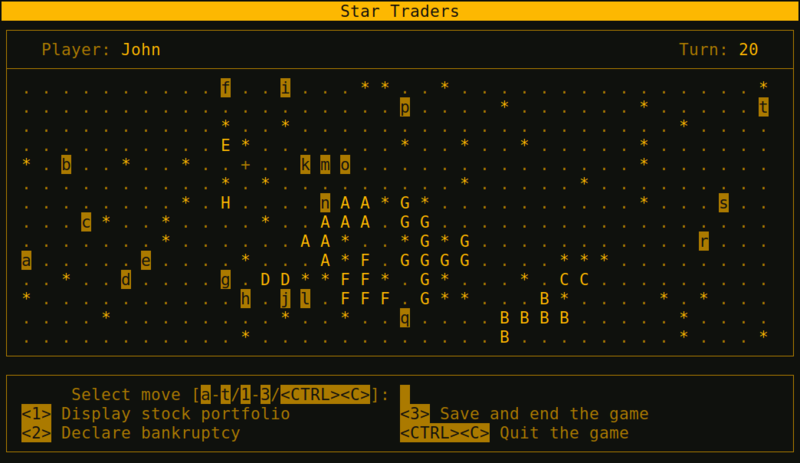 You may look at the source code of Star Traders, download a read-only copy of the Git repository or browse the source code history. 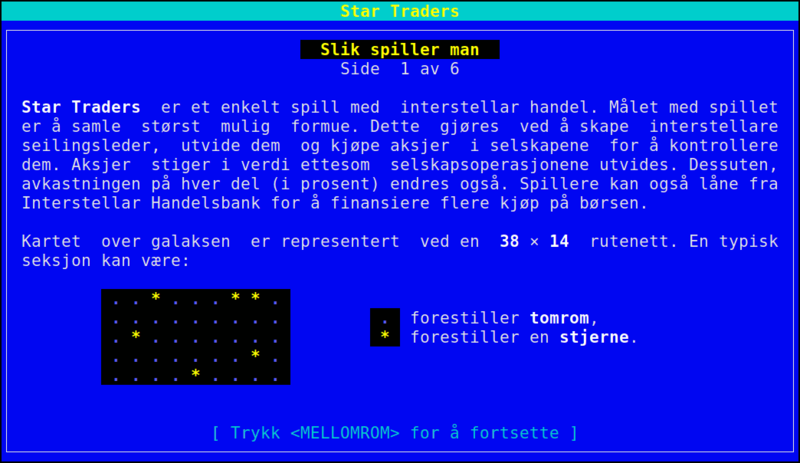 If you would like to translate Star Traders into your own language, please see the Translation Project page for trader. Note that extensive comments are available in the POT template. Additional useful information is contained in the INSTALL file (which does not contain generic GNU Autoconf instructions). 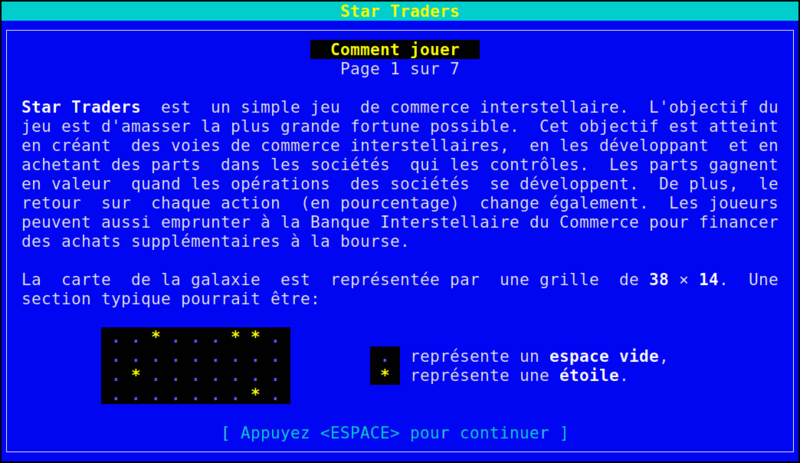 Historic versions of Star Traders are also available for your nostalgic download pleasure… All historic versions are relicensed under the GNU General Public License, version 3 or later. 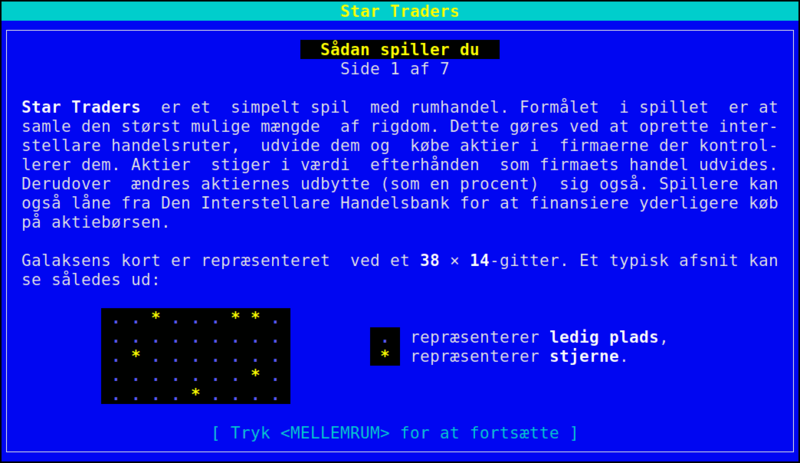 The original (and very primitive) Star Traders game was written by S. J. Singer in 1984 using Altair Basic. This was modified for Microsoft Basic (MBASIC) running under the CP/M-80 operating system by John Zaitseff and released on 7th March, 1988. 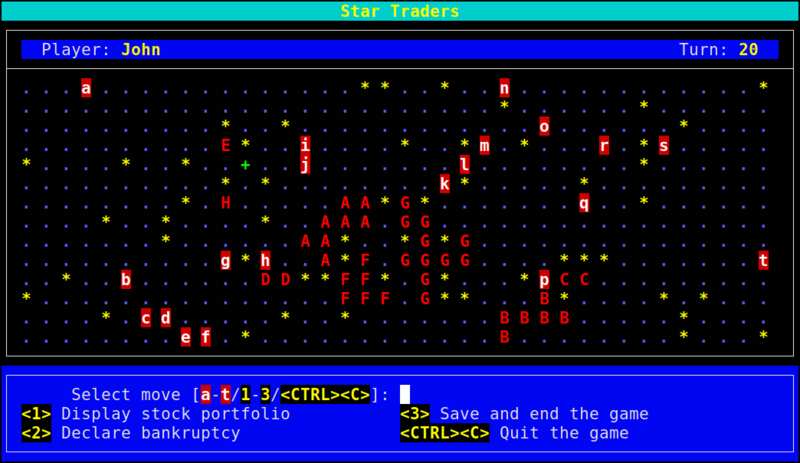 Star Traders was then completely rewritten in 1990 for the Australian-designed 8-bit MicroBee computer running CP/M-80 on a Zilog Z80 processor, using Turbo Pascal 3.01a. Essentially, only the name of the game and some of the ideas were retained in this version. 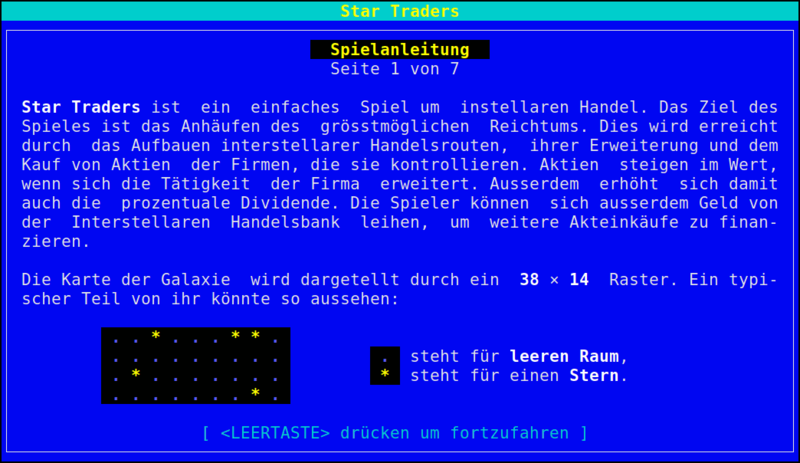 Version 4.1 of Star Traders was released on 1st August, 1991. In 1992, it was recompiled for the NEC Advanced Personal Computer (with 8-inch floppy drives!) running CP/M-86 on an 8086 processor, using Turbo Pascal 2.0. This version had colour added to it in the form of ANSI escape sequences; version 4.4 was released on 2nd August, 1993. The next version came in 1993, when the program was recompiled to run on IBM-compatible machines running MS-DOS and ANSI.SYS. Turbo Pascal 6.0 was used for this. The ANSI escape sequences were slightly different under MS-DOS than under the NEC, in that the NEC supported a number of extra character attributes. In other words, the MS-DOS version looked worse than the one running under CP/M-86! 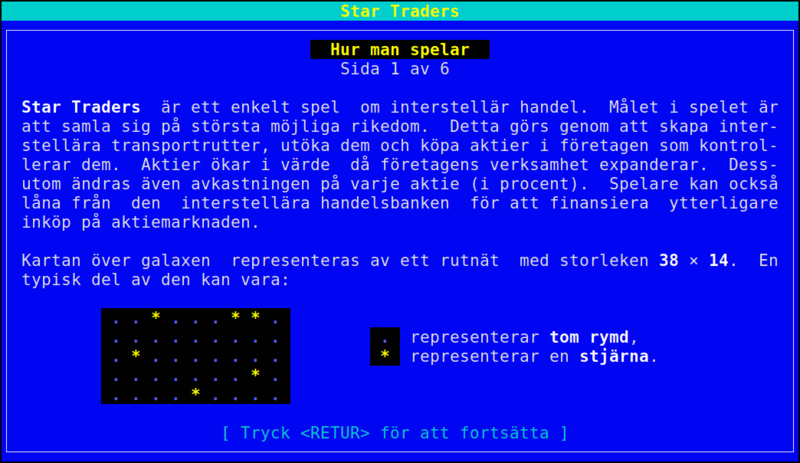 Star Traders was recompiled again in 1994 for IBM-compatible machines with VGA/EGA/CGA video graphics adapters. 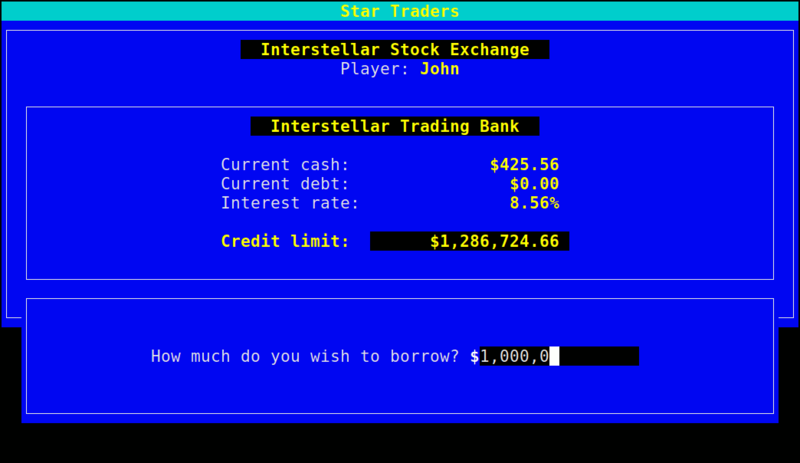 The output routines were recoded to use a “windowed” look. Borland Pascal 7.0 was used for this purpose, along with a number of text window manipulation modules. Version 5.4 was released on 1st June, 1994. 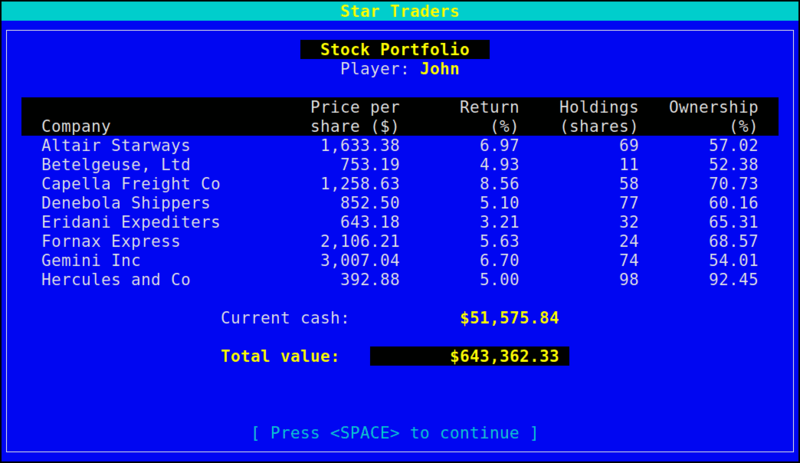 In 1995, Star Traders was completely rewritten for the 16-bit Microsoft Windows 3.1 graphical environment. 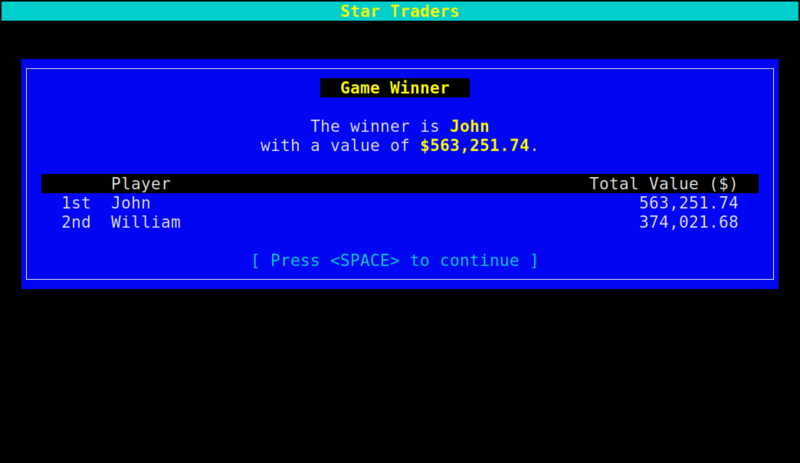 Microsoft Visual Basic 3.0 was used for this purpose. Although completely rewritten, the original algorithms were reused from previous versions. Version 6.0 of the game was released on 15th September, 1995. 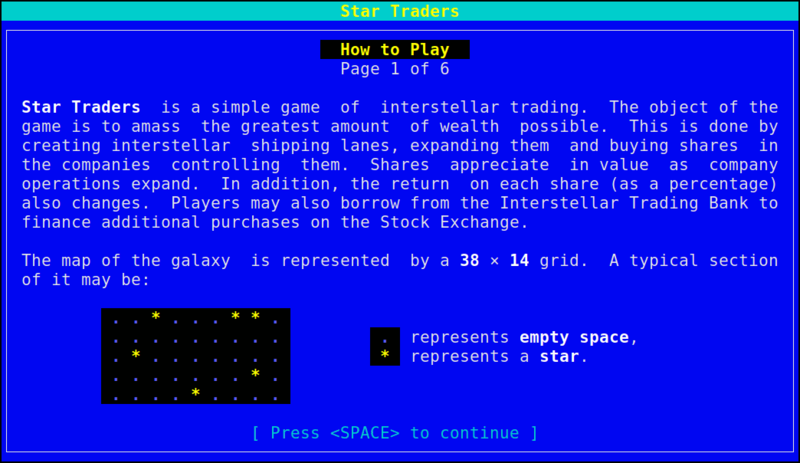 Star Traders was then to languish until almost 16 years later… when the game was rewritten once again, this time in the C programming language. Version 7.0 was released on 25th July, 2011 for Unix-like operating systems such as Linux, with subsequent releases to add features and correct bugs. Now you, too, can run this small piece of computing history! Footnote: A person going by the name of XmikeX converted the original MBASIC source code to the Commodore 128—just for fun!—and graciously informed me of the fact. Inspired by his efforts, and with more than a touch of nostalgia for the simpler personal computers of the day, I reconverted my own MBASIC source code to the Commodore 64—the original gameplay has been kept, although output routines have been slightly rewritten to cater for the 40×25 screen on those old machines. Enjoy! Select any thumbnail to open up a full-sized version. Copyright © 1990–2019, John Zaitseff. 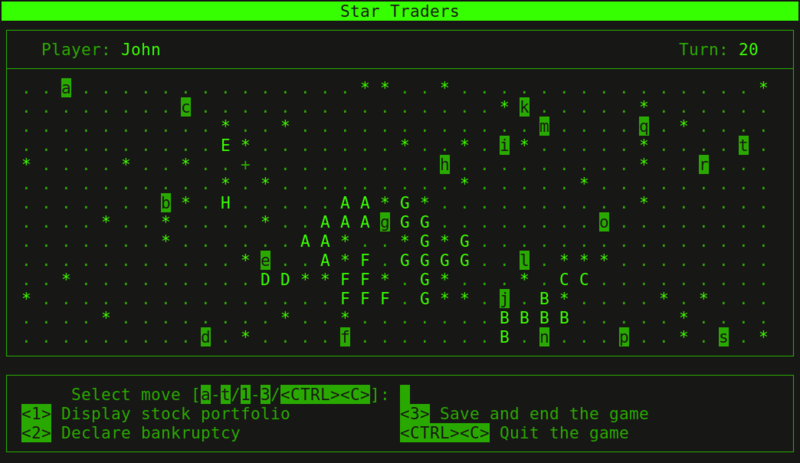 Star Traders is free software that is distributed under the terms of the GNU General Public License. You can redistribute it and/or modify it under the terms of that License as published by the Free Software Foundation, either version 3 or (at your option) any later version. This game is distributed in the hope that it will be useful, but WITHOUT ANY WARRANTY; without even the implied warranty of MERCHANTABILITY or FITNESS FOR A PARTICULAR PURPOSE. See the GNU General Public License for more details. Copyright © 1990–2019, John Zaitseff. All rights reserved. Last modified: 8th April, 2019.